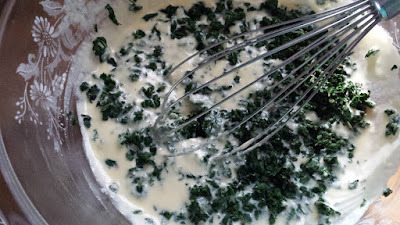 When I was planning the class I mentioned in my last post, I wanted to make sure I included a recipe that used loads of greens. The goal of the class was to teach recipes that use things that are abundant during the late spring and early summer months. 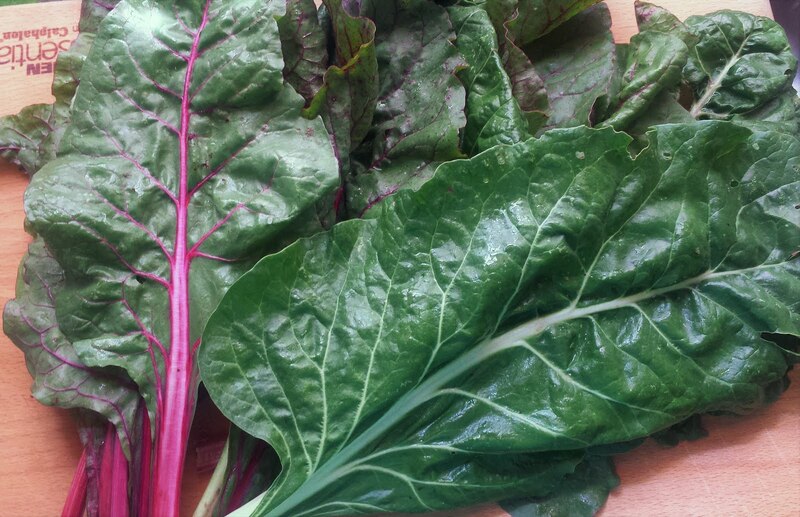 If you are a member of a CSA…or you choose to purchase most of your produce from a farmers’ market during the growing season…up until about mid-June, an awful lot of what you have to cook with are greens. 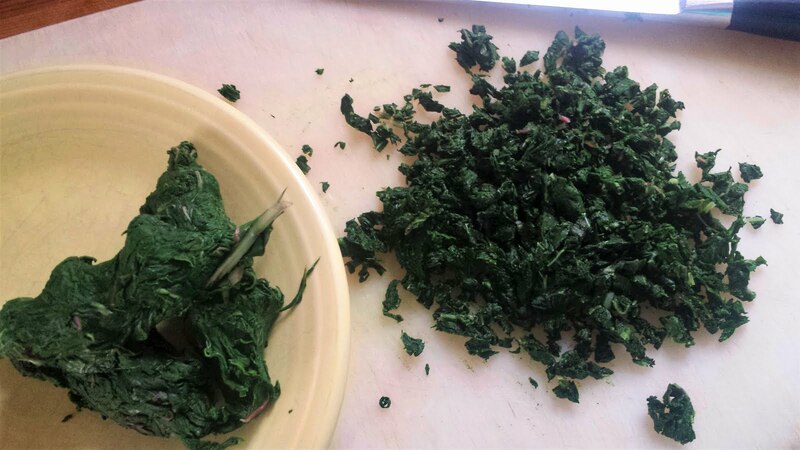 In addition to wanting to teach something that used some of those greens, I wanted to choose a recipe that would be a nice accompaniment to the vegetable curry that Nancy was planning on teaching. 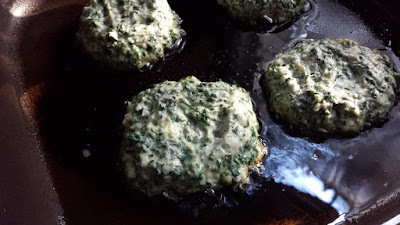 While brainstorming with her about it, it occurred to me that a Swiss chard fritter I had made for dinner recently would fill the bill nicely. The fritter I ended up making for the class was a blending of that first one I had made (a recipe I found at Delicious Magazine) and a recipe from Deborah Madison’s cookbook Vegetable Literacy. 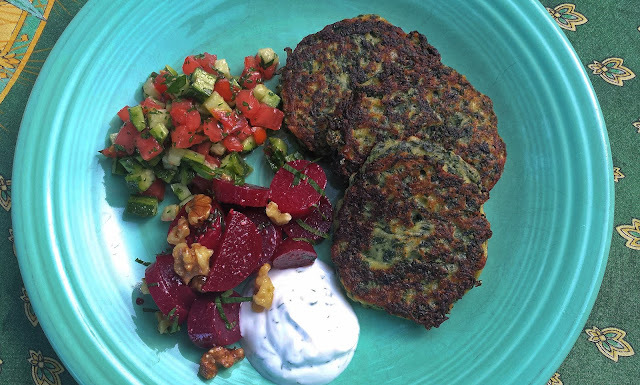 Some might not call Madison’s recipe a fritter because it is many ways similar to a ricotta pancake. But since the batter is quite thick—almost as thick as the actual fritter recipe I made first—I’m calling it a fritter. I loved the seasoning in the first recipe…and the texture of the latter. Combined, it is just about perfect. I have made these fritters with both Swiss chard and a combination of Swiss chard and Tuscan kale. I’m certain they would be delicious with all kale, beet greens or spinach. Beet greens can be substituted in the exact same quantity as the chard. For kale, you might need slightly less…and for spinach, slightly more. If you want to try and be precise about it, in the body of the recipe I give a volume and weight of the cooked greens. But in practice, if you have a little more or a little less, I think the recipe will still be successful. As for an accompaniment, I think a creamy-tangy yogurt or sour cream based dressing is essential. It adds an important flavor counterpoint. Although, you could probably sever them with a nice, tangy, fresh summer tomato sauce too. 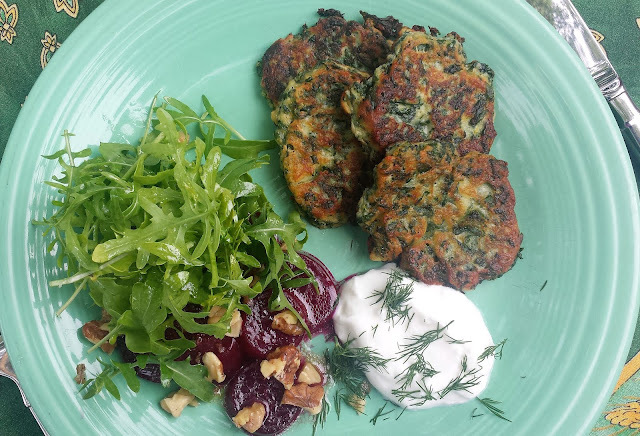 If you want to make little one- or two-bite sized fritters to serve as an appetizer, the only adornment you might want (other than the sauce) would be a sprig of dill…or maybe parsley. 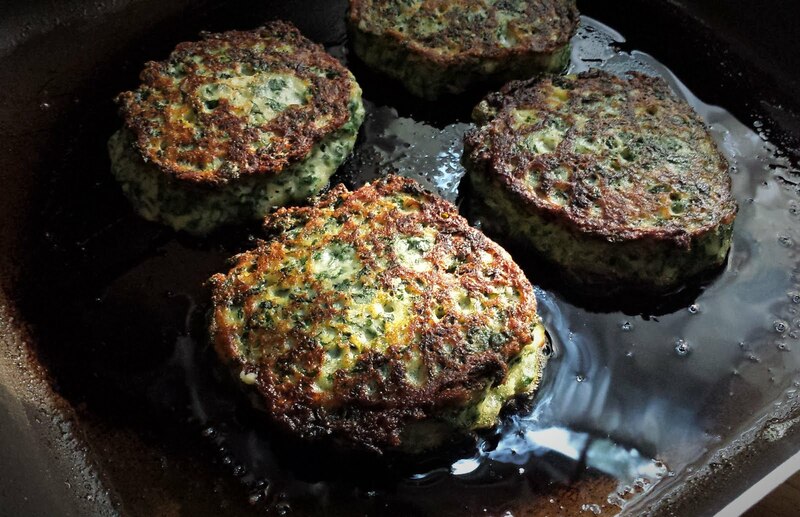 If you want to make large fritters to serve as an entrée, in addition to the tangy sauce, I think a chunky vegetable salad would be delicious. Roasted beet, fresh tomato, roasted/grilled corn, shredded carrot, and cooked chickpea salads all sound pretty good to me. I admit to being partial to the combination of this fritter with beets. The first time I made them I made an accompanying arugula and beet salad. Recently, I served it with another beet salad (with mint, cumin and walnuts) and a quick tomato and cucumber salad from the cookbook Zahav. It was delicious. 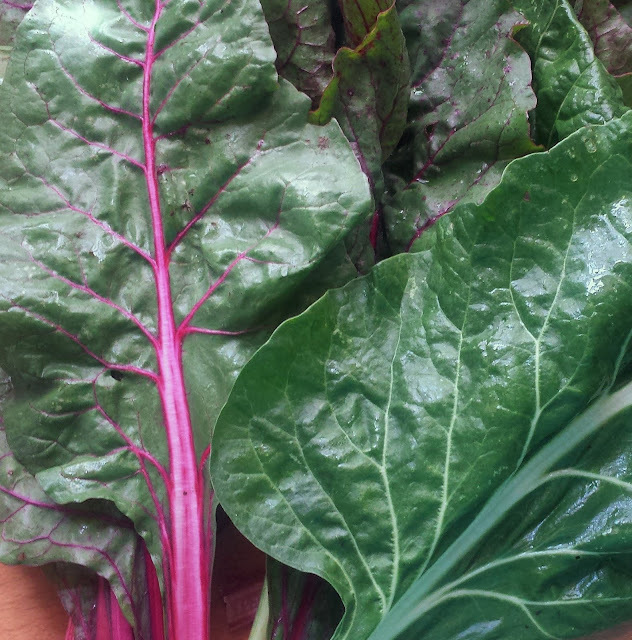 If you happen to purchase a bunch of beets with a large bunch of greens attached, you would pretty much have dinner. One of the things I love about teaching is that I have gotten to know…and make friends with…so many of those who have attended regularly over the years. Among these are a father and daughter (Ed and Emma) who both happen to be accomplished cooks and bakers. Ed is particularly knowledgeable about flours. I share this because during this class I mentioned that I suspected that chickpea flour would make a nice substitution for the all purpose flour I chose to use in the recipe (Deborah Madison used white whole wheat flour). Ed spoke up when I said this, saying that he thought the chickpea flour was a great idea, but that it should be substituted for only half of the all purpose. About a week after the class, Emma relayed to me that they had tried it and that it worked perfectly. 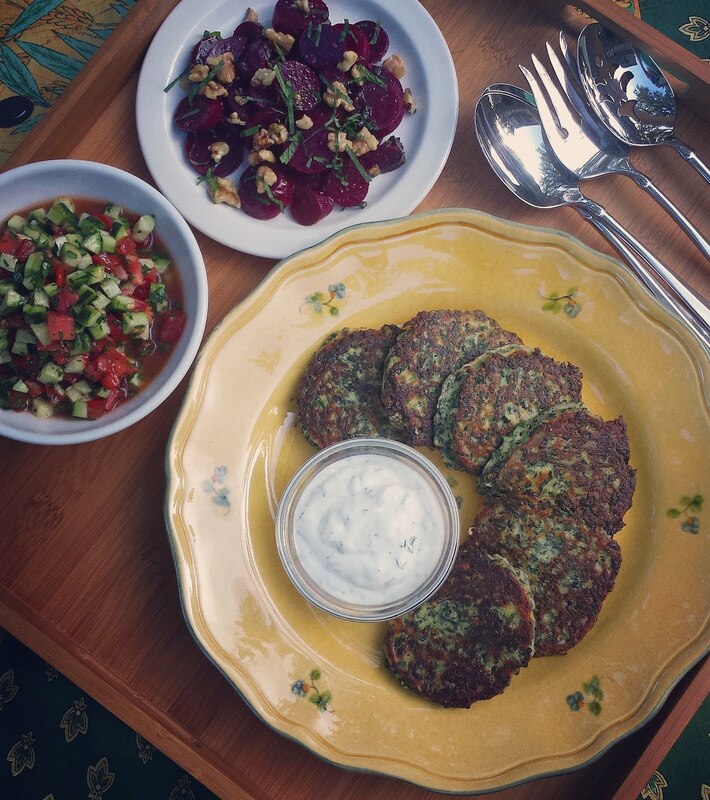 So, if you want to bump up the protein and the substance of these fritters, I’m happy to report that the chickpea flour would be a great option. I also want to mention that should you have any fritters leftover, they reheat beautifully. I have reheated mine in the microwave and Ed shared that his reheated very nicely in a skillet. They are also astonishingly good at room temperature (or even cold) if you just want to grab a few for an afternoon or mid-morning snack…or want to take them to work for lunch. All things considered, these fritters were a super addition to the class. 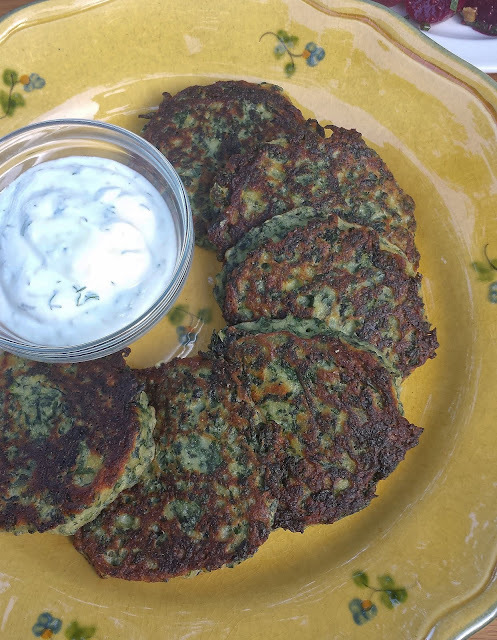 They went well with Nancy’s curry and they provided a versatile recipe (working well as an appetizer, entrée or lunch…) that exploits the early summer abundance of greens from the farmers’ market. They were a hit with the class… and they have earned a permanent spot in my repertoire. Place the flour, salt and baking powder in a small bowl and whisk to combine. 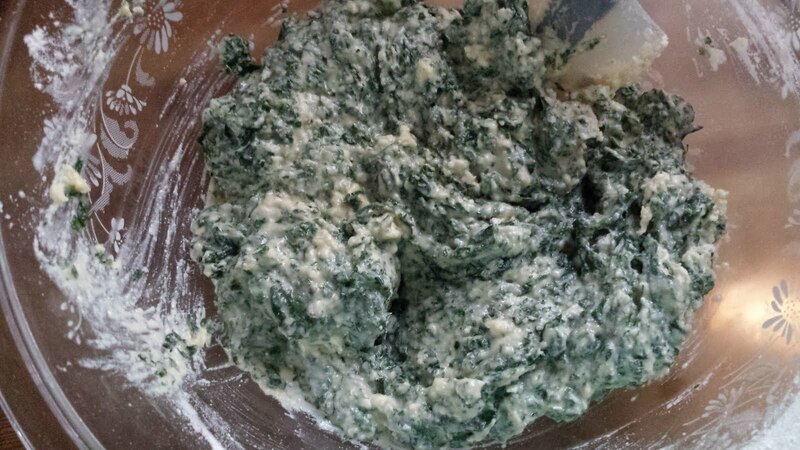 In a large bowl, combine the ricotta, milk, Parmesan, eggs, olive oil, zest, garlic and cayenne and whisk until smooth. 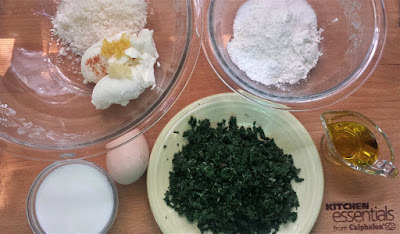 When you are ready to cook the fritters, whisk the greens into the cheese mixture. 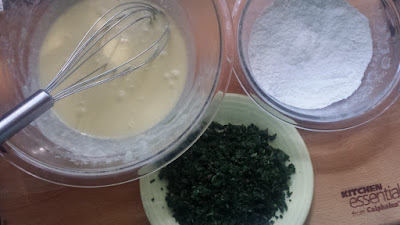 Add the dry ingredients and mix with a rubber spatula just until the dry ingredients are absorbed. Heat a non-stick or cast iron skillet over moderate heat. Film the pan with olive oil. Dollop in the fritter mixture using a spoon or a small ice cream scoop (you can make the fritters any size that you like—I like them made with a generous tablespoon of the mixture—for appetizers and a three or four tablespoon scoop when serving as an entrée). As you add the fritters to the pan, use the back of the scoop/spoon to barely flatten the batter—resist the temptation to spread the fritters out. The fritters should sizzle gently in the oil. Cook on the first side until they are golden brown and have puffed—about three minutes. Carefully turn the fritters over and cook for another three minutes. They should be golden brown on both sides and springy to the touch. Transfer to a platter or baking pan and keep warm while you finish cooking the rest of the mixture. 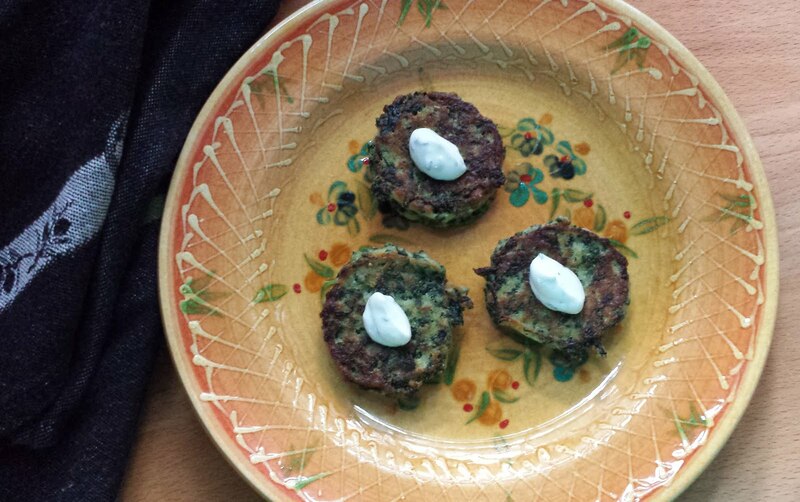 Serve the fritters hot with the yogurt sauce and a scattering of dill sprigs. Dilled Yogurt Sauce: Combine 1 cup of thick yogurt (strained or Greek) with 1 T. minced fresh dill, a small clove of garlic (finely grated with a microplaner or smashed to a purée with a pinch of salt) and salt and lemon juice to taste.